The idea for Texas Ice Cream was founded in the halls of SMU’s Cox Business School. David Croson of the Cox Strategy Department and others from the Cox Entrepreneurship Department, helped to foster the idea that a soft-serve ice cream truck would work well in the Dallas Fort Worth market. The business climate of North Texas is very welcoming to entrepreneurs with new ideas and we are happy to continue to grow our business in the area. 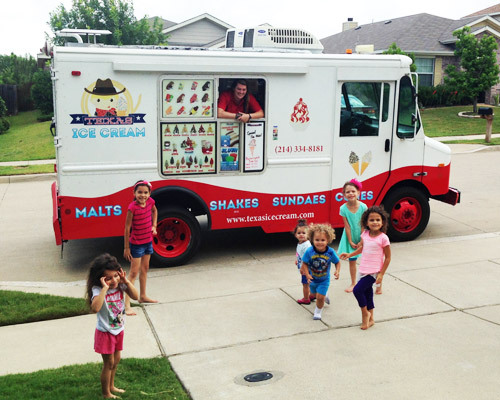 From the very beginning, Texas Ice Cream strives to bring the folks of North Texas a first-class truck that serves the best soft serve ice cream money can buy. Our drivers are known for their professionalism and courtesy. We realize there are many places to find ice cream around the metroplex, which is why we truly appreciate when folks support our business. Whether we see you on one of our neighborhood routes, company party, festival, or any other type of special occasion, we can’t wait to bring you the best ice cream around. © Copyright Texas Ice Cream. All rights reserved.